Bank of Ceylon’s (BOC) Annual Report 2015 won the ‘Best Presented Annual Report Award’ in the public sector Banking Institutions category at the South Asian Federation of Accountants (SAFA) Awards Ceremony held in Dhaka, Bangladesh, recently. 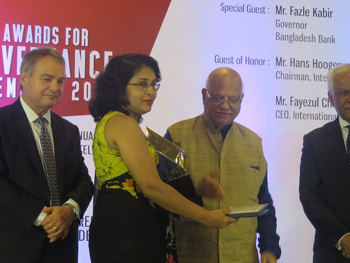 The bank’s Secretary to the Board Janaki Senanayake Siriwardane received the award from the Minister of Finance of Bangladesh Abul Maal Abdul Muhith. The bank’s 2015 annual report was themed ‘Taking Charge of Change’ as it was when BOC took bold and conscious steps towards digital-inclusive transformation. As a prudent bank, BOC maintains financial reporting standards in compliance with standards set by regulatory bodies and international reporting guidelines for financial institutions such as banks.